Riders on the Little Creek Mesa Trail near Hurricane, Utah. Photo: Bryce Pratt, crawlingspider.com. Is Utah a Mountain Bike Mecca? “Not quite” is the conclusion reached during a presentation on the topic at the 2011 Utah Bike Summit hosted April 29th by Bike Utah (bikeutah.org). The topic was presented by Cimarron Chacon of GRO Promotions and Shannon Bofelli of MTB Race News and the following is a summary of the discussion. A Mountain Bike Mecca is defined as “A world-renowned mountain biking destination and the great mountain bike trails that make them famous” (mbronline.com). According to the rankings, within North America only two states/provinces are considered Mecca’s – BC Canada and West Virginia, with Colorado as a close third with eight communities recognized as Mecca’s. Moab was the one community in Utah that was routinely referred to as a Mecca (with the St. George area and Park City mentioned occasionally) and it was clear after reviewing the components of a Mecca why these areas were listed. So why would to be want to become a Mecca? Well for the mountain biker it is obvious- increased opportunities to ride your mountain bike. But the reasons for a community or State to take this on are even more compelling: they are economic. Mountain bikers spend between $750 and $2700 per trip to a destination out of their home state. The average mountain biker spends $100 a day (excluding lodging) and 80% stay in hotels. Mountain biking in Whistler BC generated $6.6 million in spending in the summer of 2006; the Crankworx Event generated $11.5 million in one week. And, in 1996, a study estimated that Moab was generating $8 million annually from mountain biking — not bad for a town of less than 5000. When you compare mountain biking to other tourism generating activities, such as golf, running races or softball tournaments, mountain biking and trails provide a much higher return on investment because the cost of the infrastructure is low to none and a great mountain bike trail will generate multiple visits from the same tourist for years if the area offers the right stuff. Often times when the topic of mountain biking and trails is discussed with our city and state leaders there is a misconception about who mountain bikers are and what their needs and interests are as destination tourist. Statistics tell us that 1 in every 5 Americans age 16 and over rides a mountain bike. The mountain biker most likely to travel to a destination for trails has been riding a bike for at least 3 years and has the fitness and skill level of an advanced-beginner and beyond. The more passionate a mountain biker is about the sport the more likely they are to travel to one or more destinations a year to experience new trails. Mountain bikers are not “dirt-bags,” in fact many hold advanced degrees, 37% earn over $100,000 a year and they are mature (age 36-45) at the peak of their riding (outdoorfoundation.org). These folks ride mountain bikes because they seek adventure and unique experiences. They want to travel to a destination with well-marked trails and services that cater to their needs: bike friendly hotels, restaurants with a patio, and options for good beer and relaxation. Utah has the best scenery in the nation and abundant open space. In fact of the 84,899 sq miles that make up this great state 57% are federally owned, 3.5 million acres are owned by the State Trust Lands Administration, and there are many more acres that area managed by municipalities or have resources that make it undesirable for development. Utah has trails, we have great networks on our forest and BLM lands from Logan to St. George; and we have amazing signature trails as well… the Slickrock trail, Gooseberry Mesa, Mid- Mountain trail, just to name a few. 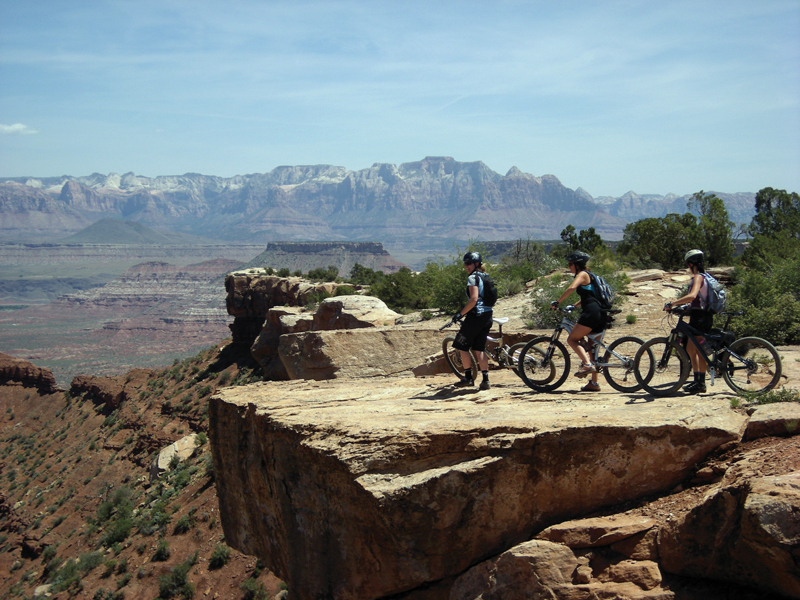 Utah also has something that no other Mecca or major Mountain biking destination has – year around riding. In fact most Mecca’s are located in the high county where the trails are covered in snow at least 50% of the year. So why is Utah not considered a Mecca for mountain biking? We fall short in several areas: state and municipal support and investment, events with a national and international appeal, advertising and marketing, connectivity to communities, embracing the cycling culture, and advocacy. Our current funding for trails and open space on a state level is dwindling and there is no alternative revenue source (like a lottery) to help fund trails and outdoor recreation projects. We need a national level mountain biking event in a Utah town every single weekend during the riding season. We need international level advertising announcing Utah as the premier mountain biking destination in the west. We need to do a better job of welcoming the non-Utah tourist to our small towns by providing the services and atmosphere they are seeking. Finally we all need to get involved. If you are not a member you can start by joining Bike Utah (Utah’s statewide advocacy organization) or your local mountain biking advocacy organization. We are so close. Volume: 29, Issue: 3, Pages: 342-353.